UNIONDALE, N.Y. -- Doug Weight made his NHL debut in a Stanley Cup Playoff game against the Washington Capitals back in 1991. On his first shift as a New York Ranger, he tripped along the boards. It quickly prompted a scoring chance the other way. 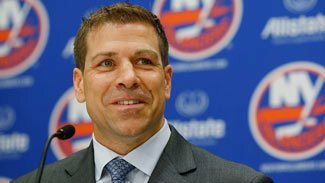 "Whoever it was, he shot it wide … it probably saved my career so I thank him for that," an emotional Weight said Thursday morning, when the New York Islanders captain announced his retirement after 19 seasons in the National Hockey League. Weight is calling it quits after a brilliant career that saw him tally 1,033 points in 1,238 NHL games. One of the finest American centers to ever play the game, Weight's retirement all but means a changing of the guard for U.S. hockey, as only Detroit Red Wings center Mike Modano remains from an era that produced some of the greatest American hockey players (Chris Chelios, Brett Hull and Jeremy Roenick, just to name a few) in history. And there's a good chance Modano may retire this offseason, too. "When he made a point, he did it with such tact and professionalism. You could feel the passion in his voice every time he spoke and you just wanted to make sure you never disappointed him." Scouting can break your heart. Projecting what 17-year-olds will do in life -- never mind on a hockey rink -- in just a few short years is an inexact science at its best and a near impossibility at its worst. But, the long odds and the hardships never deterred EJ McGuire from looking for the next find of the decade. Scouting never broke McGuire. Instead, it defined his greatness. For him, the bad coffee, the hard seat in the corner of the next municipal arena, the six-hour car trip, the inclement weather, the bad hotel or any of the other countless mishaps that befall those that chose the scouting fraternity could not put a damper on the thrill of possibly seeing -- and correctly identifying -- the potential for hockey stardom playing out before his eyes. The hockey world lost one of the "good guys" early Thursday when EJ McGuire, the NHL's Vice President of Central Scouting, passed away after a brief but courageous battle with cancer at the age of 58. For the last 35 years, EJ was a fixture in rinks around North America as a coach and scout. He coached no fewer than 10 teams at all levels of the game between 1975 and 2001, before turning his unique knowledge of the game to the world of scouting. From Brockport, N.Y., to Rochester, N.Y., to Waterloo, Ont., to Philadelphia to Chicago to Portland, Maine, to Ottawa to Guelph, Ont., to Hartford to Orono, Maine, and, finally, back to Philadelphia, EJ was a mentor to thousands of hockey players ranging from elite college and junior players to NHL professionals. Stan Gilbertson is the last of his kind. On Dec. 25, 1971, Gilbertson, then a 27-year-old rookie, slid the puck into an empty net with 18 seconds remaining, wrapping a 3-1 victory for the California Golden Seals against their in-state rival, the Los Angeles Kings -- also becoming the last NHL player to score a goal on Christmas Day. Gilbertson also has the distinction of taking the last penalty ever assessed in a Christmas game, and being in the box for the last power-play goal. The Seals-Kings game was one of six on Christmas in 1971, and represented the end of an era. Hockey on Christmas was a staple of the NHL from the 1920s through 1971, when the practice of playing on the holiday ended. Sidney Crosby enters the week with a 17-game points streak, the longest in the NHL this season and the second-longest of his career. But while he hasn't quite reached the 19-game streak he had in 2007-08, his current run already is more productive. Crosby had 30 points in 19 games three seasons ago, the third-longest points streak since 2005 (Dany Heatley's 22-gamer for Ottawa in 2005-06 is the longest). He has 35 points (20 goals, 15 assists) during his 17-game streak this season. Crosby is the first player to get 20 goals in 17 games since Alex Ovechkin did it midway through the 2007-08 season -- when Ovi finished with 65 goals. Crosby has more than one point in 12 of the 17 games during the streak, including a two-goal performance in Pittsburgh's 5-2 victory against Toronto on Wednesday. Those goals were his seventh and eighth goals in four games, and he now has 11 in his last six. For perspective, only 25 players in the entire League have more than 11 goals in the first nine weeks of the season. Sometimes very good isn't good enough. 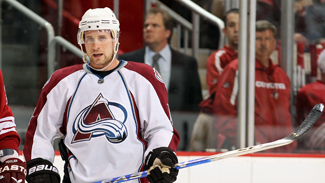 Such was the case with the play of defenseman John-Michael Liles last season -- after six seasons with the Colorado Avalanche. There was a new coach in Joe Sacco, a new general manager in Greg Sherman and some very different expectations for Liles, an Indianapolis, Ind., native -- especially after management shelled out a new four-year, $16.8 million contract to keep him in Denver. More production was expected for the price. As a result, Liles was a healthy scratch four, five, maybe six times -- the first time he had experienced sitting while healthy. After an offseason to think about what had happened, the 30-year-old defenseman raised his own expectations. Six goals and 25 assists were not good enough for Liles. That's all I needed to make my day Monday. When I received the NHL Network media release Monday, listing all the NHL preseason games they would be broadcasting, my mood certainly became much brighter. I know what I will be doing at 7 p.m. ET on Tuesday and I imagine many of you will be doing the same thing. Our game is back, and very soon the games will be counting in the standings. In the meantime, this is a good time to evaluate many of the players we are not familiar with. Some teams will give these players valuable ice time in order to see how they perform in certain situations and I will be interested to see how well they do. Other teams will be trying to build a winning atmosphere during the preseason. Those teams will be trying to win as many games as possible and that type of play is always fun to watch. I usually submit my NHL.com blog Tuesday mornings, but yesterday was not the day to do so. My routine on Tuesday is get out of bed around 5:30 a.m., make some coffee, then head to the garage to fetch the garbage and put it on the curb. Yesterday I did make the coffee and then headed to the garage, but that is when my day changed. With the garage door remote in my hand, I pressed the button but the swinging door to the garage would not open. I manually gave the door a little tug and the door began to open. I ducked under the opening door only to hear it stop abruptly. I looked up and then my worst fear became reality (the door is 60 years old) -- the door began to come off its track and was headed towards my head. I raised my hands to stop the door from meeting my noggin and was able to get the door to settle down, but it was in need of repair. Everyone is back to work today after most of us enjoyed a long holiday weekend. Many are also attending their first day of school today. I know, I know, it is hard to get back to the mentality of work and study. But look at it this way -- hockey is getting closer, much closer. Let your mind slip away for a few moments from the matters at hand and think hockey. Think about the thrill that tingles along your spine when you team takes the ice for the first time. Think out-of-your-seat goals, unbelievable saves and body checks that make your teeth rattle. We are beginning to see more hockey stories. The MSM (mainstream media) are coming back from vacation, the players are being spotted around town and most arenas have their ice down. Hockey bloggers are getting back into working mode too. Instead of all the lists, from top 10 plays in team history to top five players who played from 1990-2000, we are getting season previews and predictions for the upcoming season. We know the season is close when we read about players organizing informal workouts to prepare for training camp. In just about every NHL city, players are gathering at local rinks to get their legs in shape and their timing down to be as sharp as possible before camps start. As fans of the game, we need to start our informal workouts, too, in order to prepare ourselves for the upcoming NHL season. Have you ordered Center Ice or the NHL GameCenter Live package yet? If you are thinking of purchasing a new TV, this is the time to do it. If you really care about getting the best picture possible, make sure you get your HDTV calibrated by a professional, which gives you the best picture possible. After all, you do want to see the ice chips fly, don't you? The sounds of the game greatly can be enhanced by adding a receiver and speakers to your entertainment system. You will hear things you never heard before and sometimes you may hear things you don't want to hear, especially when the rink microphones pick up the on-ice banter.